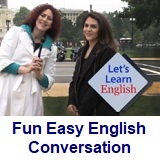 ﻿ Fun Easy English - new american english standard conversation Voice of America VOA learning English for intermediate lesson 8 The Best Barbecue discourse. In this lesson Anna goes to a barbecue battle in Washington, D.C. She learns that there are secret ingredients in the sauces. And people are VERY loyal to their favorite kind of barbecue. Anna: Thanks for meeting me. Anna: I’d like to get your advice on my latest project. Kelly: Of course. I heard you were sent to cover a big food festival that has all kinds of barbecue. So, how did it go? Anna: Well, things started out great! But then, well, maybe you should watch it yourself. 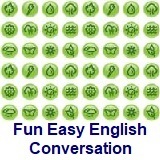 Prof. Bot: Hi English learners! Your lesson today is about my favorite food -- barbecue! Your assignment is to find passive sentences. What are those, you might ask? In passive sentences the subject receives the action! 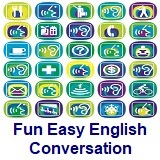 Passive sentences have a form of the BE verb + the past participle of the main verb. This lesson is LOADED with passive sentences. Hey! That’s a passive sentence, too! Okay, now, it’s Barbecue Time! Anna: Today, a Barbecue Battle is being held in Washington, D.C. This festival, which is known as one of the biggest food festivals in the United States, brings together barbecue lovers from all over the country! Barbecue is meat that is cooked over an open fire or on a grill. Chicken, pork and beef are all common meats to grill on a barbecue! No matter which meat you like to barbecue, the sauce is very important. Sauces are taken very seriously by chefs. Most ingredients are kept secret! So, can you tell us what is in your barbecue sauce? Chef 1: No, I can’t tell you. Anna: So, tell us, what is the secret ingredient in your barbecue sauce? Anna: Sauces are made by the barbecue chefs themselves. Most sauces are made with a tomato sauce, vinegar, and spices. Today, a Barbecue Battle is being held on the National Mall in Washington, D.C. Now you try. 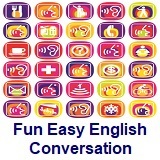 Turn this sentence from passive to active. Barbecue is loved by Prof. Bot. Good job! And yes, I do. Anna: There are some areas of the U.S. that are known for their tasty barbecue. The states of Texas, North and South Carolina and the cities of Memphis and Kansas City are known as the Barbecue Belt. People who are loyal to barbecue are really loyal to their favorite barbecue. That is why this festival is called a battle! Let’s ask a couple of people which barbecue is best. Person 1: Texas, of course! Person 2: Carolina barbecue is the very best. Person 3: I say Kansas. Person 3: She keeps saying Texas, I say Kansas. Anna: This is Anna Matteo reporting. Anna: Kelly, people feel so strongly about barbecue. Unbelievable! So, what do you think of my project? Kelly: This is what I think. There is no way that Texas has the best barbecue. I am from Kansas City and we have THE best barbecue in the whole country. My mother and father owned a barbecue restaurant, which was really famous! So, I know barbecue! Anna, I know barbecue! I know barbecue! I know barbecue!